He is quite alone, out in the midst of a choppy sea, on a moonless night. Great thunderheads roll over him. Forked lightning burns the waves. I see him turn ghost white, then he is gone, under the dark waters. The man in this dream was my closest friend in my last year at high school and my first years as an undergraduate. I had lost contact with him decades before the dream. I woke from the dream with the grim certainty that my friend had died. When I returned to Australia to speak at a Mind, Body, Spirit festival some months after the dream, I was approached by a middle-aged woman I did not recognize until she told me she was my friend's younger sister. She was eager to know whether I had heard anything from her brother. She explained that he had developed a serious drug addiction and had been in and out of halfway houses for years until he vanished altogether. The family feared he had died of an overdose. When I shared my terrible dream, we agreed that being struck by lightning in a stormy sea could be a metaphor for the effects of a drug overdose on the brain. Life went on, the years passed, and then I met my friend again, in a waking dream, during my workshop on death and dying last weekend. I had invited members of our circle to make a journey to the Other Side for "timely and helpful" contact with a person who has passed on. While drumming for the group, I had the sense of a beautiful angelic presence that had guided me on similar expeditions in the past. Gently but firmly, this spiritual guide led me to a person and a place that had not been on my itinerary. I saw a wild thing in a cage, with matted hair, frothing at the mouth, a bestial creature that barely seemed human. I was horrified to recognize something of my friend. I understood that he was still trapped in his drug addiction. I had no idea how to proceed. It would surely be imprudent to try to release this ravening, unreasoning creature from the cage. The thought came to me, This is not your friend, only the body of desire that confines him. With this thought, I saw a second version of my friend. He was beautiful. He looked the way I remembered him from the nights when we stayed up until dawn writing poems that we read to each other, and talking about Pascal and Nietzsche, Camus and Rilke. This second, superior version of my friend was translucent; I realized I was looking at his body of light. Why was it here, with the thing in the cage? I then saw the cord of attachment between the two energy bodies. I knew what to do, because I have often found it necessary to help the living to detach from unhealthy connections of this kind. I pulled the energy cord out of my friend's subtle body as you might unplug an electrical extension cord. I was moved to tears as I saw him rising into the Light. The thing in the cage could be left to disintegrate, as heavy energy is meant to do after death. The "Mother India" exhibition at the Metropolitan Museum of Art in Manhattan is a must-see. 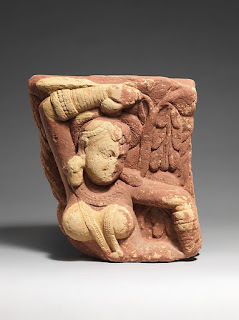 This finite, elegantly curated gathering of Goddess images from India opens us to the almost infinite, ever-changing forms of the Great Mother: as creator and destroyer, as life-giver and death-bringer, as warrior and source of regeneration. The largest group of images are of Durga as protector and demon-slayer, riding to battle on a tiger or lion against Mahisha, the buffalo demon, and legions of his cohorts. Or simply standing, primed and ready for action, with weapons brandished in her many (often eighteen) arms or bristling from her hair. 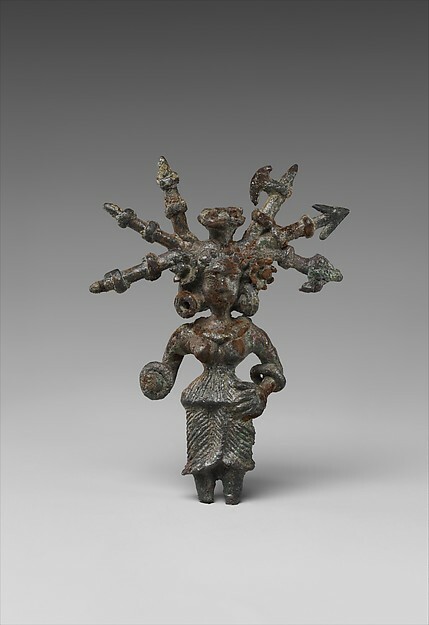 I loved the miniature statue of Durga in copper alloy from the Ganges basin, from the 2nd or 1st century BCE, with the ultimate spiked hairdo. The hairstyle remained in vogue for centuries, as other figures reveal. Pages from the Devi Mahatmya show Durga, often accompanied by a lean and hungry Kali, putting the demon armies to rout. One of the most interesting drawings, from Rajasthan and dated c.1760, shows Mahisha's human form - that of a soft and pampered maharajah - emerging from his vast buffalo body after Durga has cut off the animal head. To balance all the fighting goddess images, we have voluptuous yakshi - this one is identified as a tree spirit - curvaceous celestial maidens, generous Lakshmi figures pouring gifts from cornucopias, and an absolutely beautiful Saraswati, giver of knowledge and music, playing the vina. This Saraswati was painted in 1947-8 by Y.G. 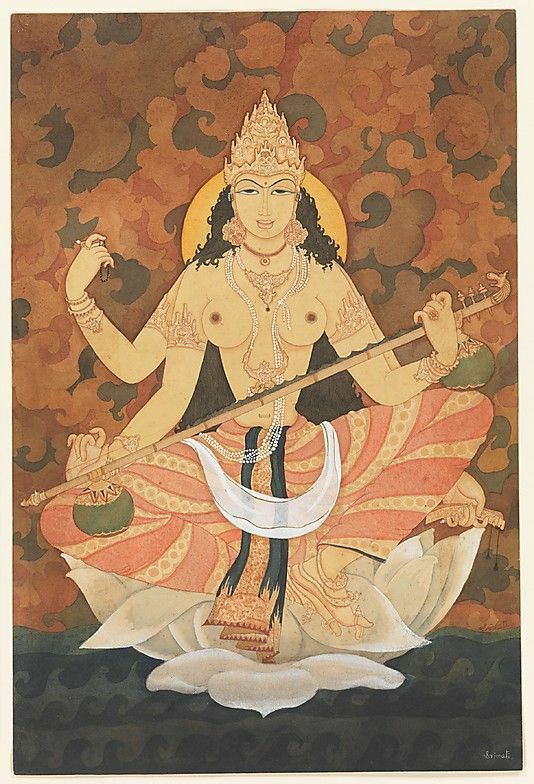 Srimati. I have known since I was a very small boy in Australia that there are worlds beyond physical reality, and that we can journey to those worlds and gain first-hand knowledge of the multidimensional universe and about what actually happens after death. When I was nine years old, I was woken up to these possibilities during a crisis of illness. I was rushed to hospital in Melbourne after complaining of a pain in my lower right abdomen. The medical staff found that my appendix was about to burst and I was wheeled into an operating room in short order for an emergency appendectomy. Under anesthesia on the operating table, I found myself hovering above my body, somewhere up near the ceiling. I decided I didn’t want to watch the bloody work with the scalpel and flowed through the door and along the corridor to where my mother sat hunched and weeping. I couldn’t stand her pain, so I drifted off to a window, to the brightness outside, to the colors of spring and the laughter of young lovers seated at a sidewalk table, drinking each other’s smiles. I felt the pull of the ocean. I could not see the beach from the hospital window, so I floated through the glass and out onto a ledge where a blackbird squalled at me and shot straight up into the air. I followed the bird and sailed over the rooftops. I saw a huge moon-round face, its mouth opened wide to form the gateway to Luna Park. I swooped down through the moon-gate – and plunged into darkness. I tried to reverse direction, but something sucked me downwards. It was like tumbling down a mineshaft, mile after mile beneath the surface of the earth. I fell into a different world. It was hard to make out anything clearly in the smoke of a huge fire pit. 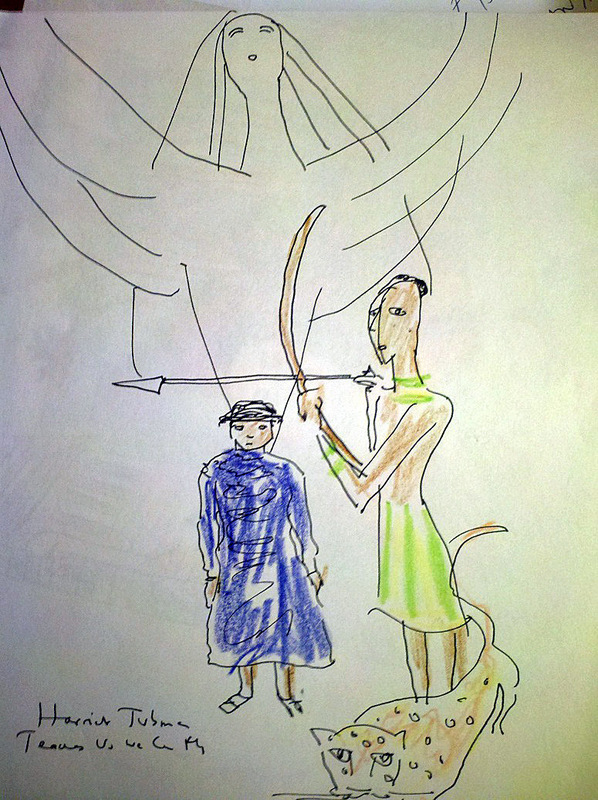 A giant with skin the color of fine white ash lifted me high above the ground, singing. The people of this world welcomed me. They were tall and elongated and very pale, and did not look like anyone I had seen in my nine years in the surface world. They told me they had dreamed my coming, and raised me as their own. For the greater part of my schooling, I was required to dream – to dream alone, in an incubation cave, or to dream with others, lying in a cartwheel around the banked ashes of the fire in the council house. Years passed. As I grew older, my recollection of my life in the surface world faded and flickered out. I became a father and grandfather, a teacher and elder. When my body was played out, the people placed it on a funeral pyre. As the smoke rose from the pyre, I traveled with it, looking for the path among the stars where the fires of the galaxies flow together like milk. As I spiraled upward, I seemed to burst through the earth’s crust into a world of hot asphalt and cars and trams - and found myself shooting back into the body of a nine-year-old boy in a Melbourne hospital bed. It was a little hard to discuss these experiences with the adults around me at that time, and we did not yet have Raymond Moody’s useful phrase “near-death experience” to describe an episode of this kind. One of the doctors said simply, “Robert died and came back” – with memories that made me quite certain of the existence of worlds beyond the obvious one, and of the fact that consciousness survives physical death. There is great contemporary interest in the NDE in Western society, and this is a very healthy thing, because to know about the afterlife, we require first-hand experience, and need to be ready to update our geographies and itineraries frequently in the light of the latest reliable travel reports. In ancient and traditional cultures where there is a real practice of dying, near-death experiencers – who may be called shamans or initiates – have always been heard with the deepest attention and respect. There is a Tibetan name for such a person, delog, pronounced “day-loak”. It means someone who has gone beyond death and returned. The famous Tibetan Book of the Dead, with its detailed account of the possible transits of spirit after death, emerged from the experiences of such travelers. But to have first-hand knowledge of what lies beyond death, we do not have to go through the physical extremity of an NDE. We can learn through our dreams, the dreams in which we receive visitations from departed loved ones and others who are at home on the Other Side, and the dreams in which we travel beyond the body and into their realms. Our dreams open portals into the multidimensional universe, including the places we may travel after physical death. As we become active dreamers, we come to realize that dreaming is not so much about sleeping as about waking up – to a deeper reality and a deeper meaning in life, and death. I loved toy soldiers as a boy and still have some on my desk, and in my games they would come alive. I also remember breaking some of my favorites when I was too ill to hold them on a hospital tray; one of those injured toy soldiers has been a important link for me in reaching to a younger self to support him in a time of pain and loneliness. I am given an exciting new writing assignment, on a high floor of a vast modern complex. In the office made available to me, I discover a gift. It is a copy of the first edition of a novel by Graham Greene that was republished under a different title that is better-known today. The pages are yellowed and the spine a bit cracked, but this book is precious to me. The card with it informs me that it was the personal property of the ruler of an East European country, "as well known as Lenin in his time", who treasured it. What do you do with a dream like this? Simple. You walk with it to your favorite used bookstore, which just happens to be a few doors down the street, a mixed blessing since the stock is forever moving up the street into my house (I am not the Kindle type). The shelf elf hadn't missed a beat. On top of the new arrivals in fiction was a handsome recent Penguin edition of Graham Greene's Orient Express. I glanced at the publishing history to verify my hunch. Yes. This is the novel that was originally published in Britain in 1932 as Stamboul Train. The American publisher wanted the title change, and Orient Express has stuck. When I stepped back through the looking glass from my dream situation, a mirror reversal took place. In the dream, I got the first edition of a novel later published as Orient Express. In the bookshop, I got the latest edition of a novel originally published as Stamboul Train. Naturally, I purchased the book, even though I knew it was highly likely that I already had a copy among my sizeable collection of books by and about Graham Greene. I stayed up until dawn to finish Orient Express. This was no hardship. The book is beautifully crafted and the smallest scenes are etched in memory. Greene called this novel an "entertainment", but it is very noir, shadowed by tyrants and secret policemen, back-stabbings and betrayals. The main plot device may seem formulaic. The fates of a mixed bag of characters - crook and chorus girl, Socialist revolutionary and scoop-hungry Lesbian reporter - intertwine as they ride a train together. But Orient Express transcends the formulas because of the author's feel for character, which is deepened by the use of dreams. As the passengers nod off on the the train, they slip into dreams. Early in the story, Myatt, the importer of currants en route to Istanbul, sees the crooked dealings of an associate as a set of floating balloons he proceeds to pop. She dreamed first that she was a child and everything was very simple and very certain and everything had an explanation and a moral. And then she dreamed that she was very old and was looking back over her life and she knew everything and she knew what was right and what was wrong and why this and that had happened and everything was very simple and had a moral. Greene adds: "the second dream was not like the first, for she was nearly awake and she ruled the dream to suit herself." He is describing a form of lucid dreaming. The brief passage hints at something further. We start out in life with the simplicity of the child; if we live long enough, and grow enough, we rise above the complexities and confusion of adult life and achieve simplicity again. Greene's own dreams at the time he wrote Orient Express were full of "disquiet" (as he noted in A Sort of Life); they color the moods of the novel and orient its plot. I was reminded that Graham Greene, a consummately professional writer capable of tapping out his daily quota whatever his excesses the night before, and a profoundly worldly and world-weary man, was also a prolific and dedicated dreamer. He benefited greatly from being encouraged to recount his dreams as an adolescent. He has cracked up at school and run away, a huge embarrassment to his father, the headmaster. He was packed off for London for three months to be sorted out by a shrink with an eclectic approach who treated Greene, then 16, by asking him to tell a dream at 11:00 every morning. Often Greene had dreams. When he did not, he would make something up. The habit stuck. He kept copious dream journals, right up to his death. They fueled much of his creative work. Some of his novels (The Honorary Consul is one) began with a dream. Sometimes a dream would fill in a gap in a plot. Often he would attribute his own dreams to his characters; frequently he felt he was dreaming their dreams. When he was writing A Burnt-Out Case he dreamed as his character Querry and could insert his dream without change in the novel, “where it bridged a gap in the narrative which for days I had been unable to cross", as he reported in Ways of Escape. Greene gave a ringing testimonial to the creative role of dreaming in a writing life in his memoir Ways of Escape: "The unconscious collaborates in all our work; it is a nègre we keep in the cellar to aid us. When an obstacle seems insurmountable, I read the day’s work before sleep and leave the nègre to labor in my place. When I wake the obstacle has nearly always been removed: the solution is there and obvious – perhaps it came in a dream which I have forgotten." 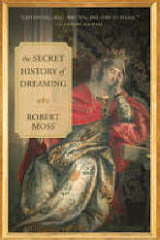 For a full account of dreams in Graham Greene's life as a writer, please see The Secret History of Dreaming by Robert Moss. Published by New World Library. She moves through the night woods on leopard feet, vanishing and reappearing. Her night vision guides her unerringly to the frightened people hiding among the sweet gums, or scrunched down inside a mudhole, aquiver for the sound of dogs or horses, coming after them. The leopard, osebo in the language of the Ashanti, is an impeccable hunter. It also knows how to hide. In West Africa, the leopard is a powerful dreamtime ally. Up to the present day, there are tales of the abakwa, the sorcerer who can shapeshift into the body of a leopard, and is greatly feared because of the leopard’s stealth and delight in the kill. In my dreams of her, Harriet Tubman was not confined to the human sensorium. She could not only fly like a bird; in the swamps and forests of the New World, she could sense and move with the grace and precision of an African night hunter. Memories of gossip heard in childhood are not evidence that Harriet had Ashanti blood, but the story suggests that the Ashanti were known where she grew up, and she was associated with them in people’s minds. The Ashanti, a warrior people of the Gold Coast (modern-day Ghana) built a powerful kingdom after 1680 with a standing army of 80,000 men, half equipped with firearms. Their chiefs, called “masters of firepower” or simply “big men”, took slaves from enemy tribes and sold them to the Europeans in the trading ports via Hausa middlemen; they boasted that no Ashanti could ever be made a slave. Nonetheless, it is likely that some Ashanti were captured and sold by their enemies. The shipping records of the Chesapeake slave trade suggest that Harriet’s ancestors were brought to America from this part of West Africa. Nearly all of the slaves brought to Maryland ports came direct from Africa, and the vast majority came on big London vessels that picked up their cargoes along the Gold Coast or from Upper Guinea. Maryland planters were constantly asking for slaves from the Gold Coast; they had a reputation for strength and stamina and craftsmanship. West African slaves brought to Maryland’s Eastern Shore did not lose their identity and traditional practices overnight. Recent archeology shows the survival of key elements of West African culture under slavery in North America: in the miniature boats and other items placed in graves, in the bones and carved objects used in divination kits. When Minty Ross was growing up, the Christianization of African slaves had barely begun. Harriet said she inherited special gifts – including the ability to travel outside the body and to visit the future – from her father, who “could always predict the future” and “foretold the Mexican war”. [Sanborn, also Bradford, Scenes 79-80]. She spent a lot of time with Ben Ross in the timber gangs, splitting and hauling wood for the Chesapeake schooners. In their quiet times in the woods, maybe they revived something of the atmosphere of the Sacred Forest of the Ashanti, and the practice of West African dream trackers accustomed to operating outside the body, sometimes in the forms of animals. We have an interesting source on Ashanti dreaming in Robert S. Rattray, a British “government anthropologist”. A few months before the New York Herald announced Harriet’s “Shantee” roots, Rattray was rowed ashore to the sweaty, dusty coastal city of Accra, on his way to the Ashanti homeland.. Rattray became a passionate student of the Ashanti, who called him “Red Pepper” because of his blazing red hair. He was a Scot who went native in a big way, dancing as wildly as a woman possessed (according to one of his critics) and also “chasing after” African women (according to another). Though sometimes baffled by the mobility of consciousness among the West Africans he interviewed, he did his best to record Ashanti dream practices in a weighty 1927 study titled Religion and Art in Ashanti. “To the Ashanti mind,” Rattray explains, “dreams are caused either by the visitations of denizens of the spirit world, or by spirits, i.e. volatile souls of persons still alive, or by the journeyings of one’s own soul during the hours of sleep.” In the Ashanti language, “to dream” is so dae, which literally means “to arrive at a place during sleep” – implying travel. For the Ashanti, what happens during these dream travels are real events. If you sleep with another man’s wife, for example, you are held to be guilty of adultery and may be punished for it. 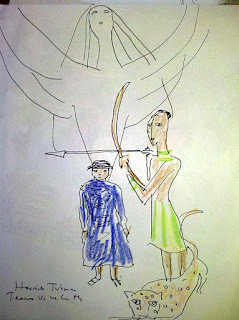 Flying is a common experience in Ashanti dreams. “If you dream that you have been carried up to the sky…and that you have returned to the ground…that means long life.” This certainly held true for Harriet Tubman, who lived to be ninety-one. Rattray describes an Ashanti practice for disposing of a “bad” dream by confiding it in a whisper to the village rubbish dump, which may also be the communal latrine. For more on Harriet Tubman and how she used dreaming to guide escaping slaves on the Underground Railroad, please read The Secret History of Dreaming by Robert Moss, published by New World Library.